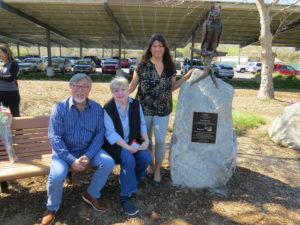 WERC founder Sue Howell, Teresa Stephenson and artist Evelyn Davis at the statue with Loki the owl located near the recreation center. 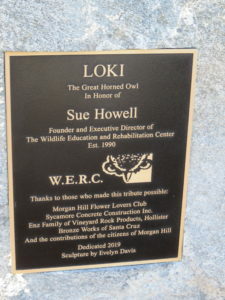 The bronze sculpture of Loki along the paved trail near the Centennial Recreation Center stands as a tribute to a Morgan Hill woman who has dedicated many years to protecting our local wildlife. 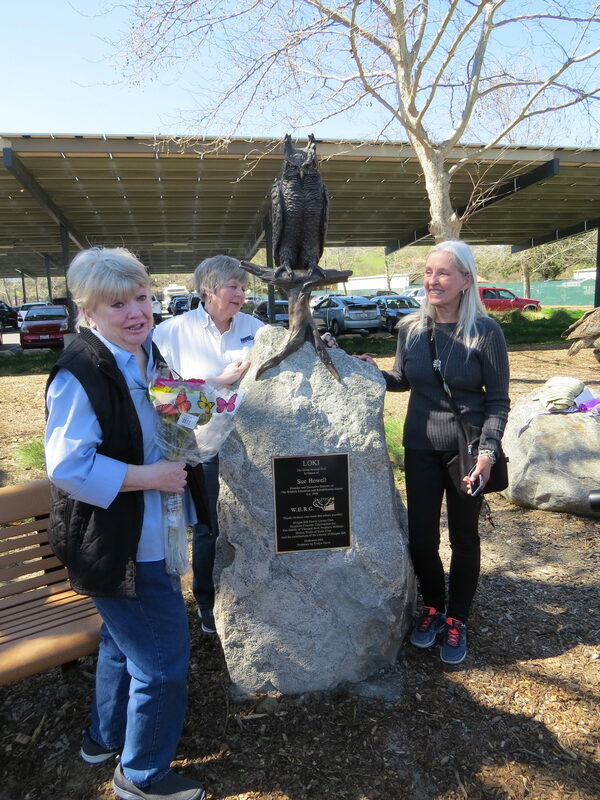 Unveiled Saturday, March 16, the life-sized Great Horned Owl perches on top of a granite rock, upon which is a plaque telling the art work was made in honor of Sue Howell, the founder and executive director of the Wildlife Education and Rehabilitation Center. Howell founded WERC in 1990 after several years of volunteering at the Youth Science Institute in San Jose. For more than 25 years the center has been located on her property in Morgan Hill. She has devoted her life to the rehabilitation of native wildlife and the education of thousands of children. In honor of all Howell’s contributions, two years ago WERC Board Member Teresa Stephenson got approval from the city council for the installation of Loki on the wildlife trail. Loki was there at the beginning of WERC and helped with its education and rehabilitation effort. He was the original logo for the center and died last year at 20. Local artist Evelyn Davis worked as a WERC volunteer and got to know Loki personally, which helped her bring the owl’s spirit into the piece. The piece is placed next to a bench under the shade of trees so people can sit and enjoy Loki staring down at them. It joins “Liberty the Bobcat,” another bronze sculpture of a playful animal installed on the trail nearby that was created by Davis. A noted sculptor, Davis also made “The Dear Family,” installed on the median in downtown Morgan Hill and the bronze “Once Upon a Mushroom,” a girl reading on a large toadstool, at the entrance to the library. She expects families years from now will come to view the bronze owl. Those who helped make the sculpture possible with financial help or in-kind donations include the Morgan Hill Flower Lovers Club, Sycamore Concrete Construction, the Enz family of Hollister (who own Vineyard Rock Products that provided the granite rock), Bronze Works of Santa Cruz, John and Teresa Stephenson, Theresa Bradshaw, Jane Hale, Neal DeChene, Colleen and Mark Grzan, Evonne Davenport and Gloria Zufall, Rene Spring, Janie and Roger Knopf and Evelyn Davis. The value of the project including the rock and installation is about $15,000, said Chris Ghione, city of Morgan Hill’s community services director. 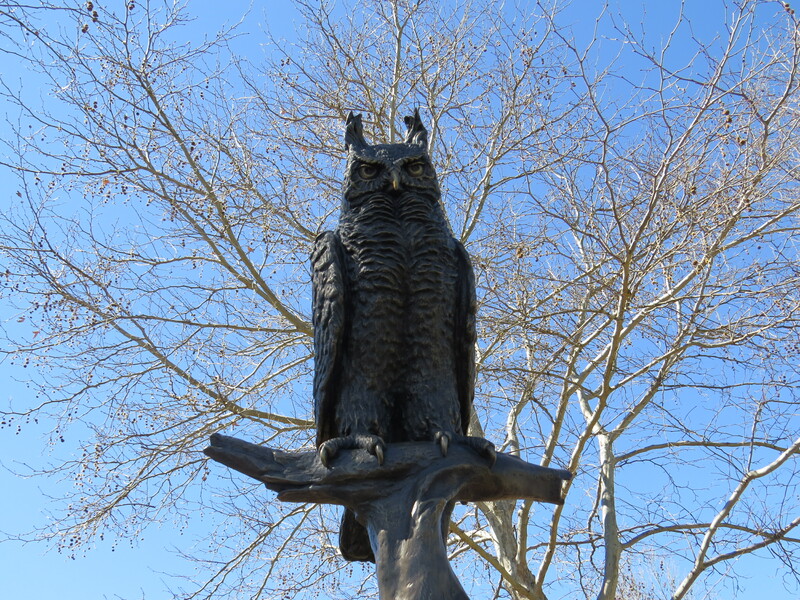 A statue of Loki the Great Horned Owl made by Evelyn Davis honors WERC founder Sue Howell outside the Centennial Recreation Center. “It was a lot of donations,” Davis said. The expression in the owl’s eyes was true to life, the artist said. She remembers coming into his caged enclosure and cleaning up Loki’s site. Howell provided construction helmets to the volunteers to protect them from the playful antics of the owl. Davis felt good the first time the owl perched on her arm. Howell said the sculpture of Loki shows the dedication people of South Valley have toward preserving its wildlife heritage. Stephenson noted at the unveiling she has volunteered with WERC for many years and enjoyed helping animals brought in after suffering some misfortune. Many locals know WERC as a part of the annual Taste of Morgan Hill downtown. In front of the Old Republic Building during that late September event, the public is treated to close-up views of raptors and mammals and snakes along with displays and conversation about native habitats and the importance of living in harmony with wildlife. Howell has also been a staunch supporter of the community. She has been a part of the Morgan Hill Chamber of Commerce for many years and served as an ambassador. She is a member of the National Wildlife Rehabilitators Association and founding member of California Council of Wildlife Rehabilitators. The sculpture of Loki is a wonderful addition to our community, Stephenson told the crowd at the unveiling. Howell grew interested in rehabilitating wild animals hurt in nature or through human contact. She and others applied for a rehabilitation permit from the state of California and founded WERC, she said. “Then the fun began,” Stephenson said. Howell and other volunteers learned how to rehabilitate animals concentrating on the native animals in the area. They brought the non-releasable animals into schools and other places to teach adults and children about the creatures. She went through training and certification and even traveled to Alaska to learn about eagle rescue. WERC volunteers often take in bobcat orphans and raise them until they’re mature enough to be released into the wild. To prevent the bobcats from becoming habituated to humans, volunteers dress in a bobcat costume and crawl on hands and knees into the enclosure, a technique Howell developed. “She did such a great job that her procedure became part of the Fish and Game protocols of raising orphan bobcats,” Stephenson said. While alive, Loki served as WERC’s mascot. He went to schools, rode in the parade, showed himself off at barbecues, and helped raise money. City Councilmember John McKay recalled at the unveiling that in 2010 when he graduated from Leadership Morgan Hill, its organizers told class members about opportunities to join a nonprofit board in kind of an apprenticeship program. He picked WERC.